There are old games, and there are ancient games. Beneath Apple Manor is ancient. 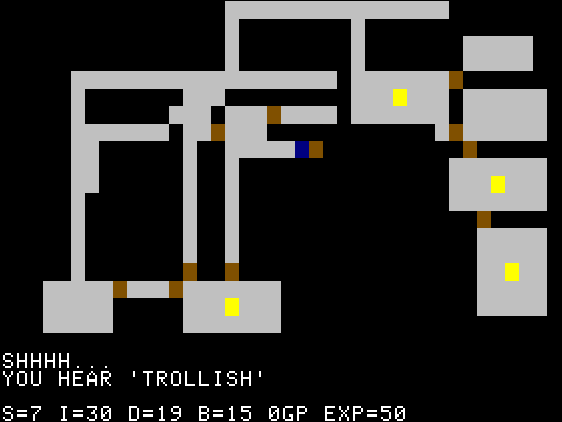 Arriving in 1978, it was the first, or one of the very first, RPG-like games for home computers. Yes, personal computing goes back that far. It could run in as little as 16K RAM (tape version) or in 32K+ (disk version, which I had). Levels were created on the fly as you went deeper in the dungeon. Monsters were limited to five: green slime, ghost, troll, purple worm, and red dragon. However, they increased in power the farther down you went. Each had its own type of nastiness. Slimes could dissolve armor. Ghosts reduced your Strength permanently. Trolls regenerated. Worms could kill you in one hit, as could Dragons, who also had very tough hides. BAM could be customized, too. You chose the number of rooms per level (4-7, depending on RAM), the difficulty factor, and whether you wanted black & white or color graphics. With color, everything was a different colored block. 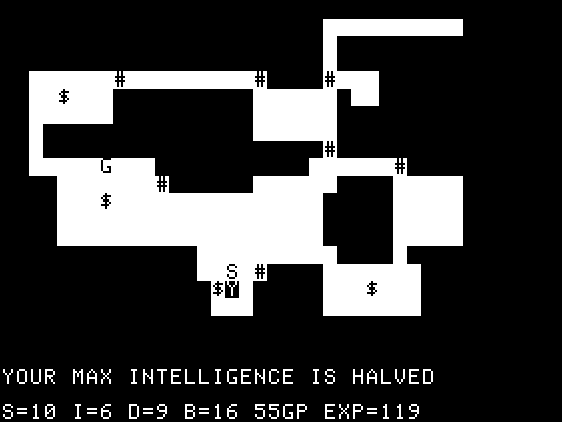 I much preferred the ASCII black & white, where the monsters (player, too) were represented by letters and treasure by $. You had four stats: Strength, Dexterity, Intelligence, and Body. Fighting depleted Strength, so a breather after combat was necessary to restore it. Likewise, movement reduced Dexterity and spellcasting lowered Intelligence. Resting brought those back up, but only a Heal spell could restore hit points. This was not a game of fast movement and rapid-fire combat. 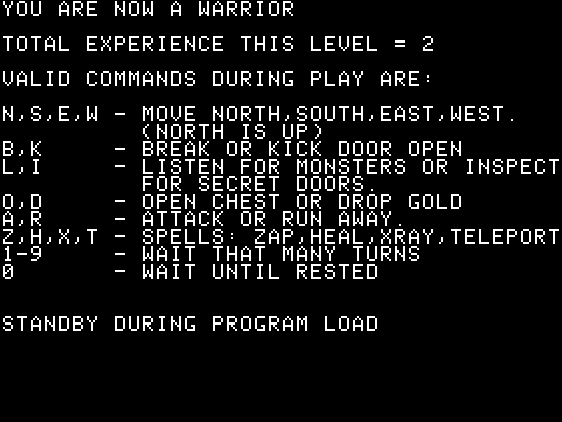 Experience was earned by killing monsters and bringing treasure back to the main staircase, the starting point of each level (it wasn’t marked on the map, either, so better remember its location). Here you traded points at 10 xp for 1 stat point, increasing it permanently. Gold could buy upgrades to weapons and armor. Most important of all, you could purchase a “brain scan”. It was your character save. Should you die – sooner or later, bound to happen – the scan restored you to life at the staircase. Of course, any money you had at the time was dropped. However, you were alive again as of the last scan. And you’d want a new scan as soon as you could afford it. Each use reduced the save by 10%. Ouch! Too many restores of the same scan would leave you a wimp. So you proceeded carefully along the level, Listening at doors, Inspecting walls for secret doors, Bashing stuck doors open, Running when overmatched, and hoping you wouldn’t run into too many wandering monsters. All this had a goal: to find the fabled Golden Apple, rumored to be in a dragon horde far below the surface. Naturally, it exists, and there it is! Or is it? You know the saying: there can be only one (though not a ring this time). But each horde had a supposed Apple; grab a fake, and you were restoring at the staircase. How could you tell real from fake? Only – haha – by taking it. You don’t always need heavy combat to induce sweaty palms. BAM had to be played entirely in one session. The brain scans were good only for the current game. Quit, and you’d have to start a new game next time. Still, it was meant as a “quick” play. At 5 rooms/level, you could usually get through it in about four hours or so. Thus BAM was a prototype for Rogue and its many variants. Sadly, it seems to have been overlooked in the history of this subgenre, even though it arrived two years before Rogue itself showed up in 1980.